This spring and summer, the Michigan DNR and several partners released more than 12,000 juvenile lake sturgeon in public waters, part of an effort to rehabilitate this culturally significant fish species, the DNR said in a news release. This year’s total is twice the number stocked in 2017, according to the DNR. 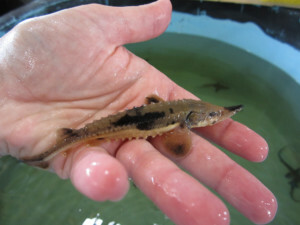 The lake sturgeon is on Michigan’s Threatened Species list. These annual stocking efforts – supported by several important partners who work to secure needed funding and resources – are critical to restoring the state’s lake sturgeon population, the release said. For more information, visit michigan.gov/sturgeon .